Have you ever looked at a row of beautiful beachfront houses and imagined a giant wave crashing in from the sea, wiping them all away? 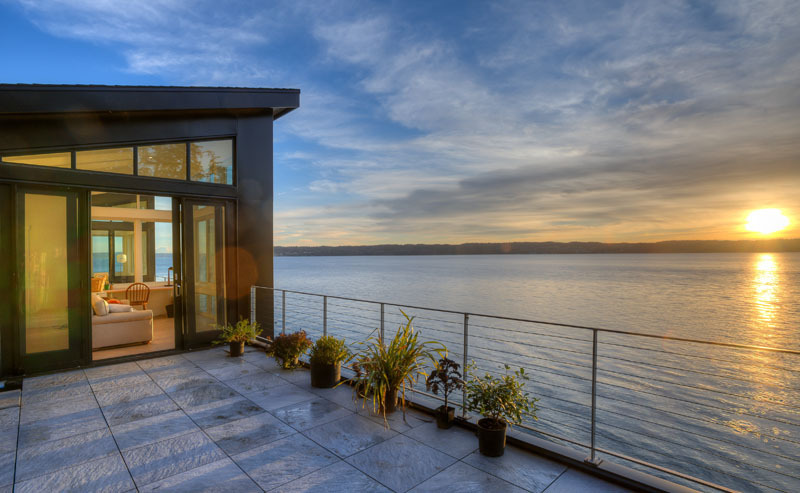 Waterfront architecture can seem awfully vulnerable, and it’s true that when beach houses aren’t engineered with weather protection in mind, they’re probably not going to last long. 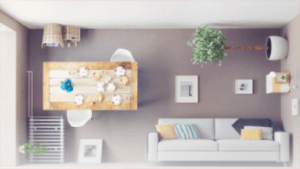 All it takes is one storm surge for the coast to be inundated with water, instantly flooding the impeccably decorated interiors of all those high-end properties. With climate change, the chances of this happening are only going to grow, so some architects are starting to design around the worst-case scenario. 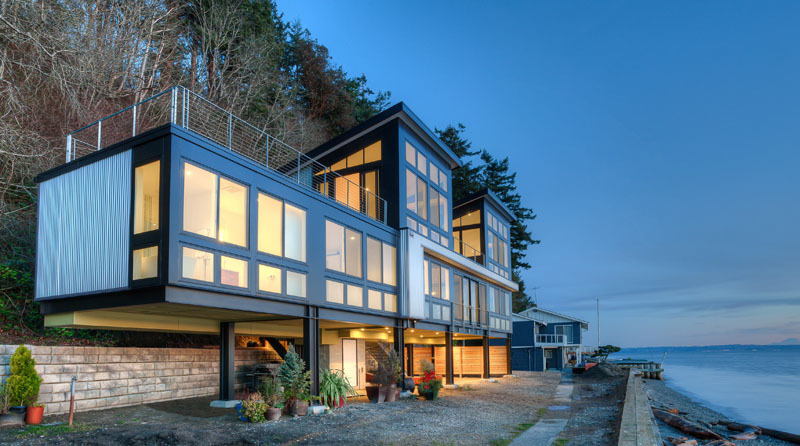 The plot of land this particular beach house sits on, a narrow stretch of Camano Island, Washington, complicates things even further: it’s located at the base of an extremely steep slope that experiences occasional shallow mud slides. Threats from multiple sides might be enough for some to give up on such a property, but for the homeowner, it’s sentimental; it’s been in his family for three generations and he grew up spending summers at a modest cabin that now sits to the side of the main house. Architecture firm Design Northwest took on the challenge and produced a modern beauty that’s ready for almost anything. The beach is so remote, there’s no drive-up, requiring the owners to park in a common lot and walk down a narrow path to reach their home. That made it too difficult for the architects to bring in concrete trucks and other heavy equipment. Plus, a geotechnic study determined that the site wasn’t safe for conventional building techniques. Their solution? Raising the house on steel stilts rather than putting in a high retaining wall. 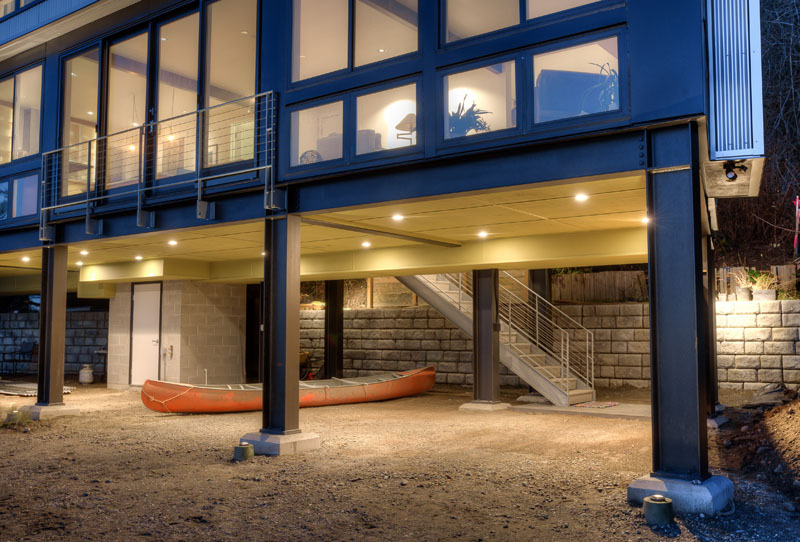 These ten-foot supports elevate the lowest level of the house well above the beach, and any mud coming from the slope can just slide right under it. This creates storage space for canoes and other outdoor recreation equipment. The northern end of the house is cantilevered to avoid having to cut into the slope for additional supports. 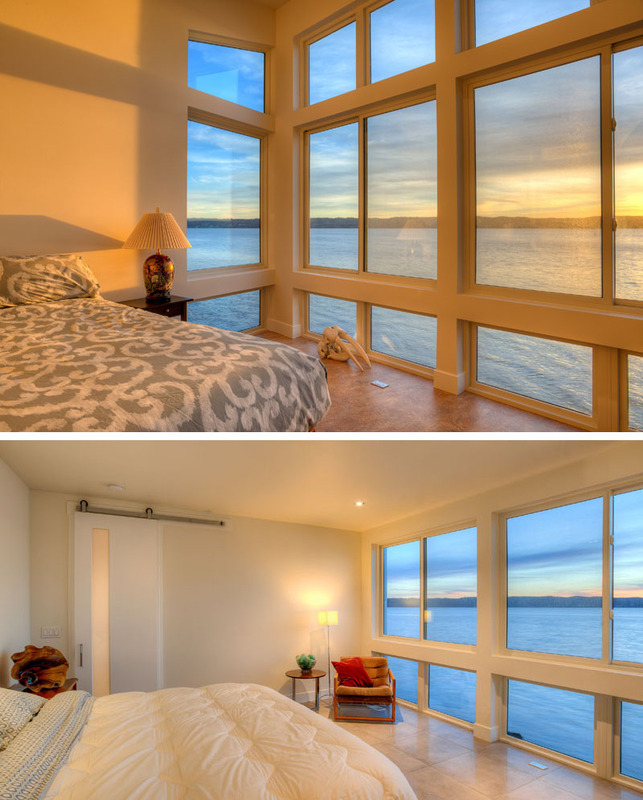 Concrete stairs lead from the ground level into the living area, where an entire wall of windows looks out onto the Puget Sound. 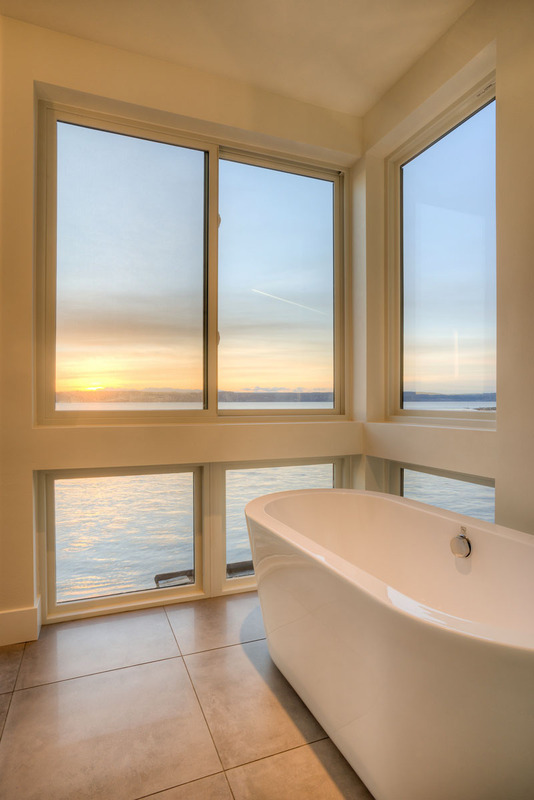 The views are incredible just about anywhere in the house, but the bathtub looks downright heavenly, and there’s also a tiled terrace with a rooftop garden on the top floor for whale-watching and enjoying the beautiful West Coast sunsets. Beneath the cantilever on the ground level, the homeowners plan to cultivate a fern garden. The interior marries contemporary influences with traditional beach house aesthetics, full of bright white surfaces and mottled grey tile that mimics the look of the clouds outside. Since the back of the home faces the slope, the architects chose not to insert many windows on this side, effectively focusing views on the most beautiful parts of the property. That’s not hard, considering what they have to work with. Clad in metal siding, this contemporary beach house is ready to stand up to whatever nature can throw at it.